Anyone out there who has been following this blog for any period of time will know that I have been DREADING this chore. 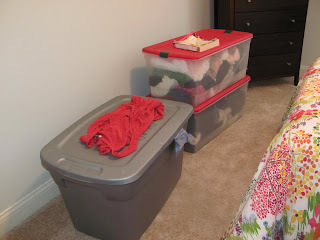 It has been on my "to do" list since before I started the blog, and I have even blogged about doing it quite a few hundred times, and just have not gotten around to doing so yet. Every time I tell myself "this is the day" or "this is the weekend," I do something else instead. Anything else, really. 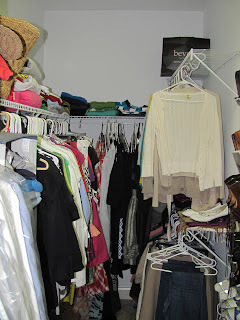 I HATE cleaning out my closet. I am not sure why I hate this task so much. I think part of the problem is that I am completely and utterly indecisive about even the silliest things. 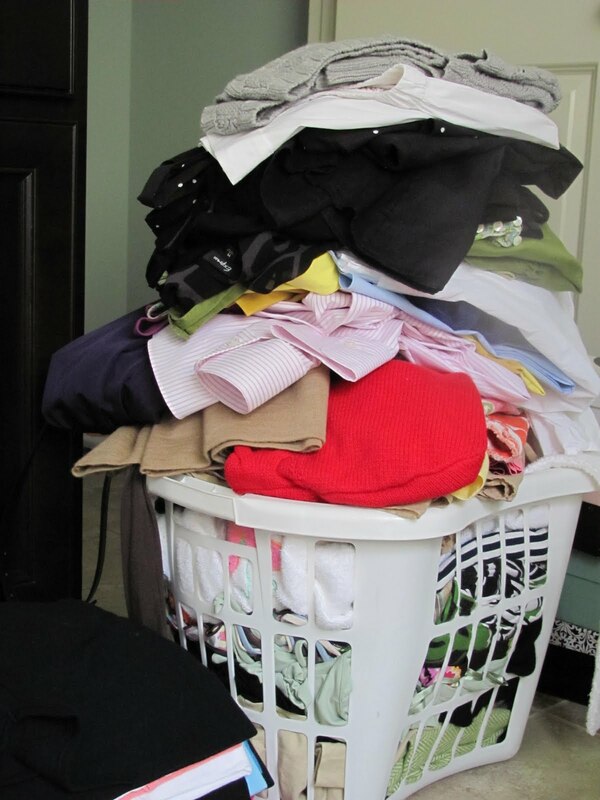 So for me, deciding whether or not to keep or throw out one item of clothing may or may not take 30 minutes...and at that rate, it could take weeks for me to finish this one small(ish) chore. 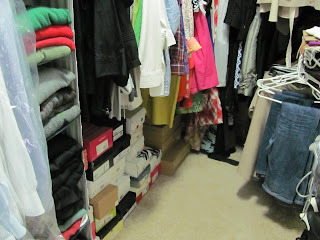 The other part of the issue is, I have a little bit of a problem when it comes to clothes and shoes. The problem is this: I love them and cannot get enough for them. Just walking into my closet and getting into the mindset of cleaning it out is a feat in and of itself as a result. Not only is it tedious, but it is emotional. Try telling yourself that yes, you for sure need to throw out your favorite skirt that you wore in college because your fat rear will never fit into it ever again. It is really tragic! I originally decided to clean out my closet because a girlfriend of mine gave me three huge tubs full of maternity clothes. 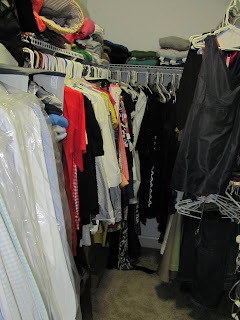 Luckily I have still been able to wear my regular clothes so far, because while I am oh so grateful for the clothes she's letting me borrow, I have not yet had a chance to thoroughly sort through them and organize them because I literally have nowhere to put them. Not to worry, I took before and after photos of operation closet cleanout you could see (although I am sad to say that you can't really tell much of a difference). 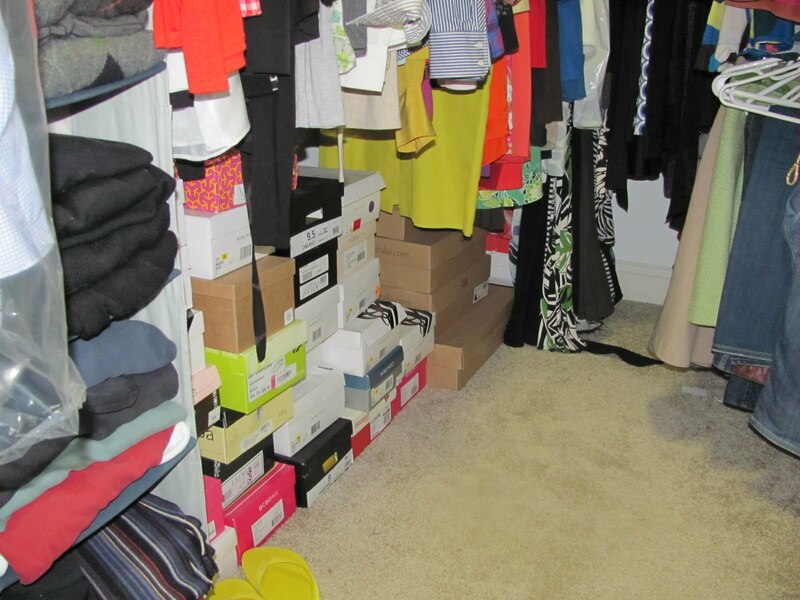 The amount of stuff I decided to get rid of was astounding even to me, simply because I already did one closet clean-out this year - in March, when we moved into our house - that resulted in approximately 6 HUGE black garbage bags full to the brim with clothes, shoes and accessories. It is an absolute disaster, and the disarray gives me a headache to even look at. I am honestly sad to say that there was not room to hang one more piece of clothing in that closet. 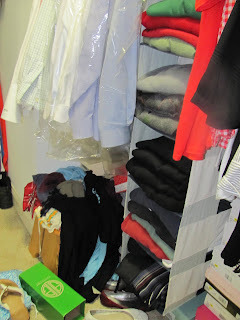 I couldn't move the clothes that were filling it to the brim at all to even fit anything else in. And that is SAD considering I have a full closet at my parents' house right now since I've been staying here for work for several weeks. So, believe me when I say, this needed to happen. 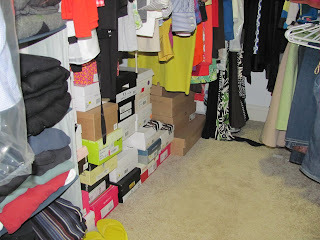 I will refrain from mentioning that if only my husband would either (a) just move his items to some other place in the house or (b) give me a bedroom to convert to a closet, we would not have had this issue to begin with. It doesn't look like a lot there (which is why I tried to zoom in on the piled-high circular basket), but when I transferred it to tubs I filled up 3. Whoops. While I didn't make it through all of them, I got through two out of the three. Not too shabby for 5 hours on a holiday weekend. 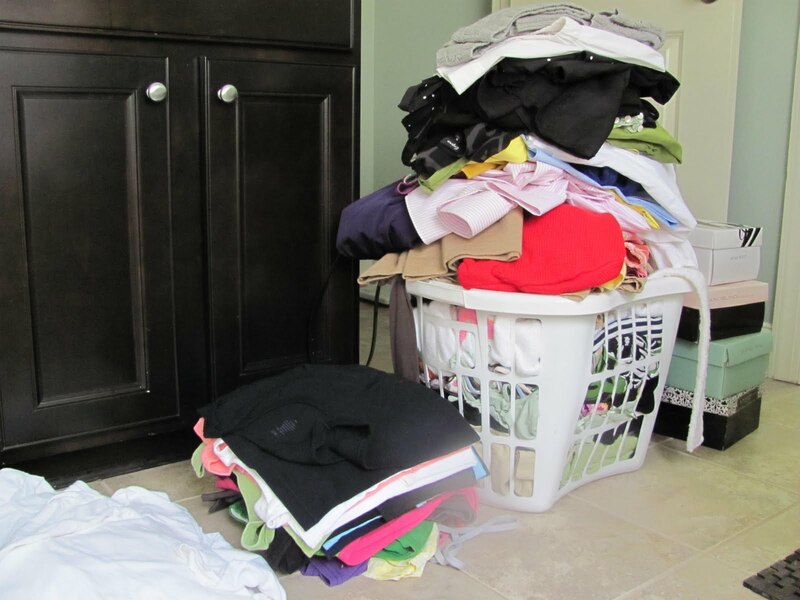 While I am proud of all of the household projects we accomplished this weekend, there is one downside: there is SO MUCH I still want to do around the house. So much art and so many accessories to be bought, and so much decorating still left to do. I know, it will all come in time (or when we grow a money tree in the back yard, whichever comes first), but I am so impatient! Plus, now that Baby B is on the way, I feel sure the nursery is going to take priority at approximately 10:05 next Wednesday when we find out the gender. Oy! That's all for tonight! Hopefully my nesting posts aren't boring you, because I've got another one coming up sometime this week. Hope everyone had a happy Tuesday that didn't feel like as much of a Monday as mine did!